Early spring 2006, SFU entered into an agreement with Australian-based IBT International College to set up their first Canadian undergraduate college for international students wishing to enter SFU. Locally named Fraser International College (FIC), the facility was to be open by early September, creating a very tight design and construction schedule to opening. The site available was an existing 32,000 GSF 2-storey steel-frame building leased by SFU in a research park adjacent to their Burnaby Campus. 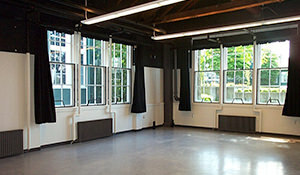 The Lower Floor level of the building is designed for classrooms and computer labs as well as overflow facilities for SFU undergraduate programs. FIC’s administrative offices are also located on this level as well as a student lounge and faculty meeting room. 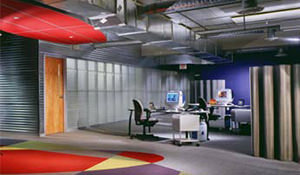 With major renovation work underway, it was decided by SFU Campus Planning & Development to have the design/ construction management team re-plan most of the Upper Floor level for use by four different SFU Administrative work groups, each requiring individual reception areas, offices, meeting rooms and technical support but with a common lounge. The ambitious project schedules were achieved. As part of the feasibility study for rehabilitation of UBC’s Old Auditorium as an ‘Opera Centre’, the future of the 15,000 sq. ft. Hut M-18 came under review. Constructed in 1925 as a campus service building, this underutilized heavy timber frame/ shed roof ‘heritage’ structure provided storage and basic shop space for Music & Theatre’s stage props. In phases over 4 years, The COLBORNE ACHITECTURAL GROUP Pacific designed painting studios with 1,000 sq.ft. mezzanine, Fine Arts metal and woodworking shop with faculty offices and classrooms. A new 120 seat rehearsal studio for Theatre in the southerly 2 storey space created rehearsal space complimenting the similarly renovated Hut M-17. Full seismic and Code upgrades were also completed. Hut M-17 provides 16,100 sq. ft. of usable area with one-storey south portion of the building dating from 1925 (similar to adjacent M-18) and 2 storey north addition dating from the early 1950’s. The COLBORNE ACHITECTURAL GROUP Pacific determined that despite significant mould contamination in the north addition, value remained in the original wood structure. Retrofit involved significant removal of interior partitions to allow re-planning of space for theatre rehearsal studios, Fine Arts darkroom, faculty offices and student social space. Reconstruction also permitted full seismic upgrade of the structure along with access for disabled persons including new hydraulic elevator. The exterior maintains existing ‘rough stucco’ heritage finish (patched and re-painted) with extensive new fenestration and metal siding. The COLBORNE ARCHITECTURAL GROUP Pacific was commissioned in the fall of 2002 to review site plan options for locating a 1,200 sq. ft. hazardous materials storage facility. No processing was to occur, only bulking of science lab processed chemicals and holding in a secure environment for regular removal by waste disposal contractors. Meeting Provincial hazmat handling standards, CAGP designed a modest single-storey, concrete/ steel frame building set into a steep embankment, easily accessed from a central loading dock with freight lift. 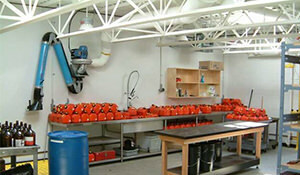 The interior is simple, open plan with flexible work area, bulk chemical storage racks and administrative support space. Fully grounded with all ‘spark-proof’ light fixtures and mechanical equipment, the building has large skylights to eliminate the need for lighting to be activated other than for winter or night usage. 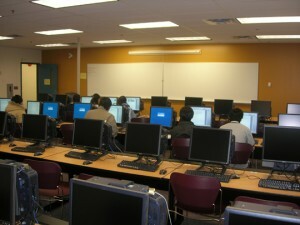 The Technical University of British Columbia began teaching students in the fall of 1999 with a mandate to specialize in computer-related studies. During its start-up phase, Tech BC required interim facilities to be built within leased space in Surrey Place Mall. The COLBORNE ARCHITECTURAL GROUP was retained in collaboration with Architectura to undertake the design of the interim facilities as well as to plan for the interior fit-out of the university’s permanent campus at Surrey Place. CAGP had primary responsibility for the coordination, production and implementation of the design of the Interim Facilities project, referred to by the client as “BetaSpace”. The project converted approximately 70,000 square feet of former retail space into a fully functional interim university facility. 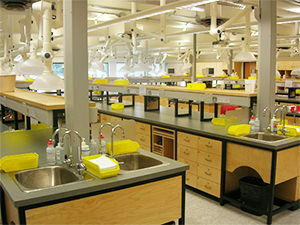 The Colborne Architectural Group Pacific has carried out design and implementation of several science lab projects for the Departments of Biology, Chemistry and Kinesiology at Simon Fraser University. Projects typically entail re-planning and re-construction of existing lab facilities to suit new research programs or to replace worn fixtures, equipment and implement technology upgrades. Projects include a full range of lab design issues from the coordination of fully-serviced work benches, incorporating specialized lab equipment, designing animal-handling areas or providing new mechanical/ electrical systems for new lighting, IT networks or AV equipment. 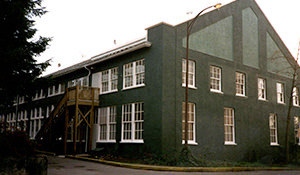 In January 1992, UBC’s Campus Planning & Construction commissioned the COLBORNE ACHITECTURAL GROUP Pacific to conduct a feasibility study for relocation of The Faculty of Graduate Studies’ administrative offices to the existing 3 storey Graduate Student Centre. This entailed creation of 12,000 sq. ft. of multi-use areas within the previous food services facilities. The multi-phase project also included planning and renovation recommendations for an additional 12,000 sq. ft. of student offices and recreation space including 125 seat restaurant/bar, 100 seat student pub and 8,000 sq. 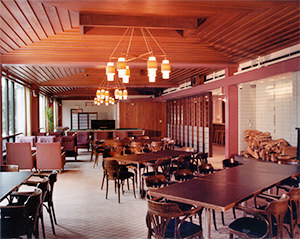 ft. banquet hall. Final planning and design involved interior and building envelope upgrades for the c.1970 Graduate Student Centre and adjoining c.1961 Thea Koerner House, a ‘heritage modern’ Massey Medal award winner. Upgrades also included full seismic and accessibility improvements with new elevator and exterior ramps.